This episode is insane, and fast, and punky, and silly. You’ve been warned if you’re not into that kind of thing. It’s got a lot of new bands that I think stand shoulder to shoulder with the more “classic” ska/punk bands presented here. …and oh yeah, a new Reel Big Fish song. Go nuts! Ok, sure, a Dark Pretzel ride isn’t technically a roller coaster. It’s something else. It’s in the family for sure. Kinda like this episode. All these songs are for sure in the ska family, but they mess around with the style, push and pull away from the beat, but there’s a touch of ska in each. I hate to brag, but I really like this episode… a whole lot. I hope you do too! 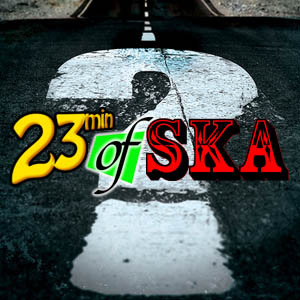 Back again for another thrilling episode of 23min of Ska! Hope you dig this one! I have to say, it was a little tougher than I thought it was going to be, theme wise, but in the end, I feel like it came together. Heck even if the theme faltered a bit, with a line up of bands this solid it is still sure to a great episode! Hope you enjoy it! Is everyone ready for 2016? I sure am! Another year for some great ska music! I mean 2015 was a pretty damn fine year! Hell, just in December some truly great ska albums came out, some of them represented on this very episode! So strap in, 2016 looks like it is going to be just as awesome! 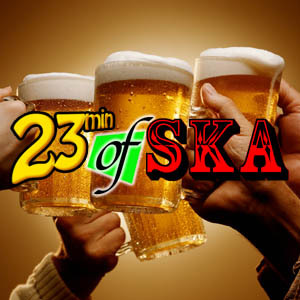 Also, if this is your first time checking out 23min of Ska, well, I feel that this episode is pretty great and pretty typical, so if this is the kinda thing you like to hear, subscribe on up! This is the 200th one that’s been produced, so go download the other 199 (+ special eps)! Where exactly are we now? What are we doing here? Who are these people? Why are we here? When can we go home? Questions, we all have them. We should never stop having them. Those in power seek to keep power by keeping us occupied. Break the chains. Look up to your leaders and ask them questions. The ones that are worth following will be happy to answer. Bang, this episode gets off with a real start! Hey, it’s a brand new song from the Backyard Superheroes off their brand new EP! It really kicks off this episode thematically too! That’s right, all these songs have a thing or two in common. It’s cool, you don’t have to guess, all the songs feature drinking in some form. Not saying it is good, not always even the focus of the song in question, but drinks, they will be had! And hell, why not, in America it is a holiday weekend, so pop corks and twist the caps, and have a great time!